I love soy sauce, but since I discovered Tamari, I can safely say that I love it more than regular soy sauce. I basically like it because it has a smoother flavor, but many choose it over soy sauce because it's gluten free. It is made with 100% soy and no wheat, whereas regular soy sauce is made 50% soy and 50% wheat. As such, San-J Tamari is certified gluten-free and can be a part of a gluten-free diet. 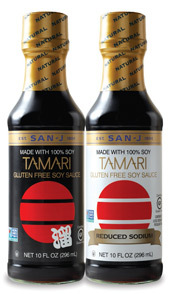 Right now you can print a coupon to save $.55 on San-J Gluten Free Tamari Soy Sauce.